The Damascus sky lights up with missile fire as a U.S.-led coalition launches an attack early Saturday, targeting different parts of the Syrian capital. President Trump announces Friday that a U.S.-led coalition has launched a military response to the Syrian government's alleged chemical weapon attack earlier this month. 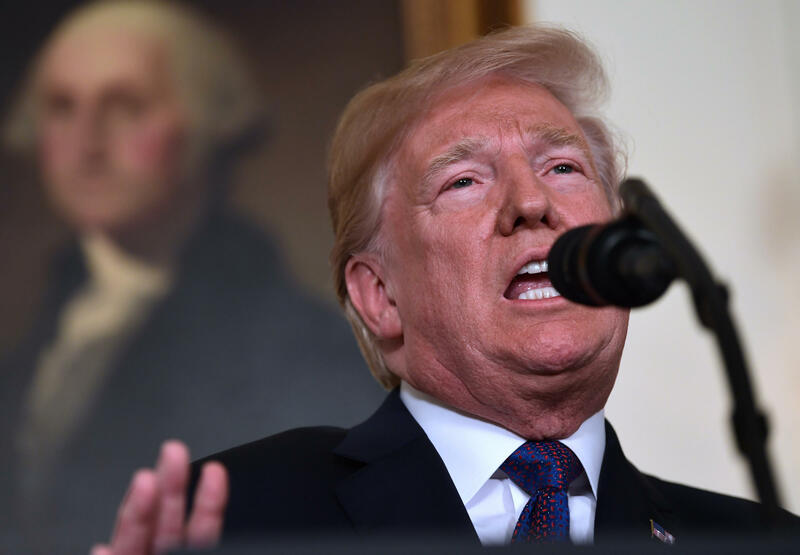 "We are prepared to sustain this response until the Syrian regime stops its use of prohibited chemical agents," President Trump said in televised remarks from the White House. Defense Secretary Jim Mattis and Joint Chiefs Chairman Gen. Joe Dunford said the three countries called on warships and piloted aircraft to hit the sites linked to Syria's chemical weapons program. One site was a science research facility in Damascus, the Syrian capital, where residents said loud explosions rang out. The other two were storage facilities around Homs, a city to the north of Damascus. Residents in Damascus were caught off guard by the strikes, independent reporter Danny Makki told NPR, speaking from Damascus. "Everything over the previous 48 hours has indicated toward some sort of de-escalation, that the attacks might happen in the future. But for the attacks to happen in this way at this particular time — it's taken Damascus by surprise." Syrian state media said the country's "air defenses shot down 13 missiles south of Damascus," NPR's Ruth Sherlock reports from Beirut. Gen. Dunford said the attacks would substantially reduce Syria's ability to research, develop and use chemical weapons. There were no immediate reports on casualties or the extent of the damage. The Pentagon said it would provide a more detailed assessment on Saturday morning. The sites were chosen to minimize civilian loss of life and possible release of chemical agents, the Pentagon officials said. Mattis said the number of weapons used was about double those employed in a strike in April 2017. 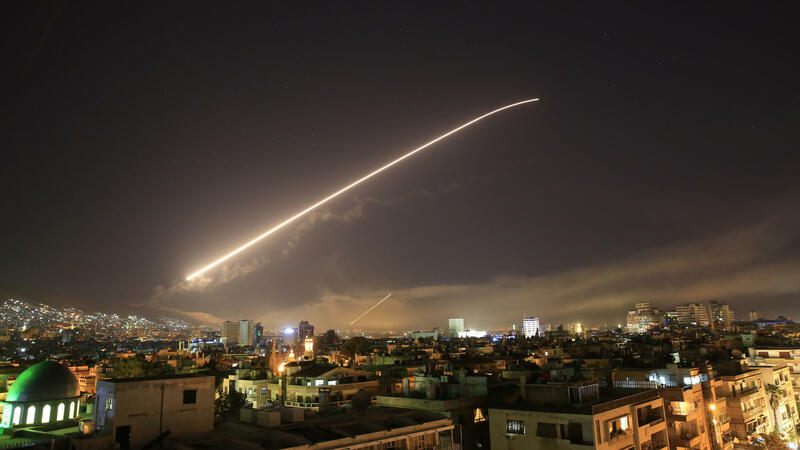 In that instance, 59 Tomahawk missiles were fired at a Syrian airbase in the western part of the country following a chemical attack blamed on Assad's forces. Mattis said he was not aware of any U.S. losses, and added, "Right now we have no additional attacks planned." The defense secretary said on Thursday that he favored a measure response aimed at chemical weapons facilities, and did not want the U.S. to become more deeply involved in a complicated, many-sided conflict. Dunford said the U.S. used its regular communication channels with the Russians to inform them about the U.S. aircraft, but did not warn the Russians about the targets. Nikki Haley, the U.S. ambassador to the United Nations, said Syria had used chemical weapons at least 50 times since the war broke out in 2011. The U.S. has about 2,000 troops in northeastern Syria, where they have partnered with Kurdish fighters to dismantle the Islamic State. With the extremist group largely defeated, the president says he supports the withdrawal of U.S. forces. "America does not seek an indefinite presence in Syria," he said. "The United States will be a partner and a friend. But the fate of the region lies in the hands of its own people." U.S. military officials have said they believe the American forces should remain a while longer to help stabilize the places where ISIS was pushed out. Trump, meanwhile, also addressed the governments of Iran and Russia, both of which support Assad. "I ask what kind of a nation wants to be associated with the mass murder of innocent men, women and children," Trump said. "The nations of the world can be judged by the friends they keep. No nation can succeed in the long run by promoting rogue states, brutal tyrants and murderous dictators." Referring to Assad, Trump said, "These are not the actions of a man. They are crimes of a monster instead." The suspected chemical attack occurred on April 7 in the Damascus suburb of Douma, which had been held by rebel forces for years in Syria's continuing civil war. Civilians and rebel forces abandoned Douma following the latest attack. In the days leading up to the U.S. attack, Russia had warned that it would defend its troops in Syria. This has raised fears of a possible direct clash of U.S. and Russian forces. In a statement late Friday night, the Russian ambassador to the U.S., Anatoly Antonov, said, "We warned that such actions will not be left without consequences. All responsibility for them rests with Washington, London and Paris." Over the past year, the Russians have continued to help Assad's regime improve its position in much of the country as it battles various rebel groups. Assad's government controls most of the major cities, which are located in the western part of the country.